FAQs | . :: Amigo Software ::. What are the specifications of the server? Please download details from the Portal for the required specification for the respective number of units/ extensions. Do I have to pay for the QuickSUITE server again in case we purchase another solution for the same site? No, once a site has the software server installed, the respective number of additional licenses of an added module will be charged only. We offer complete software-based solutions, until or unless a Voice Recorder is required for analog or TDM lines or if the handsets type is not IP. This scenario will require a small piece of hardware, Blue Box, which will Packetize the analog/digital signals to IP for recording. This is shipped to your doorstep within 2 to 3 working days. What happens if I change or upgrade the Phone System? As far as the Phone System is for Alcatel-Lucent, it will be supported. Yes, you can install it yourself also but charges are very minimal anyway and need to be paid for the first installation only per site. Does recording work for remote extensions? Yes, voice recording is made available for remote extensions through VPN or FTP. Does QuickRECORD work with TDM & Analog lines? Yes, QuickRECORD records analog & TDM lines, through the trunk side. This scenario will include a small piece of hardware, Blue Box, which will Packetize the analog/digital signals to IP for recording. This is shipped to your door-step within 2 to 3 working days. Can we Silently monitor our agents? Yes, QuickRECORD has an add-on feature of silent monitoring which allows a Group Admin or Supervisor to listen or monitor any call through the web interface in real time. Is it compliant with PCI and MiFID II? Yes, QuickRECORD comes with the feature to Record on Demand, Record from Now and Record Entire Call making this application industry complaint with both the standards. How Does VoIP Recording Work? Is there a module for training? Yes, QuickSCORE is an add-on module for QuickRECORD with multiple levels for monitoring and quality control. Who can see the stats on the wallboard? Stats can be seen by an entire room through a plasma screen or by the specified personnel through web access. Do I get performance report for agents? Yes, reports are available per agent extension. Can we create multiple ACD groups for a single site? Yes, multiple groups can be created to streamline processes for different departments or campaigns. Is there a feature for Alerts? Yes, threshold Alerts can be set-up and the specified tile or statistic will start flickering once the threshold is breached. Can we integrate with third party applications? Yes, QuickIVR can be integrated with a third-party database through an integration engine. The information provided or keyed in by the caller can be used to verify the identity or to fetch the relevant information through the third party database. How many vertical and horizontal branches can we add to this IVR? Unlimited branches can be added to QuickIVR, irrespective if they are horizontal or vertical. Does this application have a module for the Hospitality sector? Can it work with the hotel PMS? Yes, it can integrate with PMS. QuickPOP integrates with a number of CRMs including Salesforce & Microsoft Dynamics. Contact us for the list of supported CRMs. Can we use it for excel, Outlook or any other contact management database? Yes, QuickDIAL works with any desktop or web application for quick and error-free dial campaigns. Does it create a log for the dialed calls? Yes, you can keep track of logs of any agent. Do you have connectors for Rainbow? Yes, we have an array of connectors for Rainbow. Is there a solution for CPaaS? Yes, QuickBOT was created to cater to real-time updates and monitoring for Rainbow User. What advantages do I get from Amigo compared to other Partnering Options? 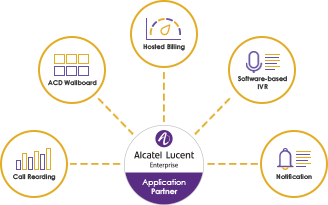 Amigo Software is a known Application Partner for Alcatel-Lucent for over a decade with an array of certified telephony solutions. What is the support policy? We are available throughout the year with UK office timings. Please note we give around the clock support for a certain level of Partnership only. Do you provide on-site installation and maintenance?